Israeli forces raid Khan al-Ahmar, July 5, 2018. Photo credit: Suleiman Abu Srour for WAFA. Palestinian popular resistance has forestalled the demolition of Khan al-Ahmar, but Israeli Prime Minister Benjamin Netanyahu insists the village will be destroyed soon. Human rights groups call it a “war crime.” United Nations officials expressed concern. The European Union urged Israel to meet its obligations under international law. And the International Criminal Court cautioned against war crimes. Yet, Israeli authorities insist that the demolition of Khan al-Ahmar, a Palestinian-Bedouin village east of Jerusalem home to around 180 people, is imminent. “Khan al-Ahmar will be demolished very soon, but I am not saying when,” Israeli Prime Minister Benjamin Netanyahu said at a press conference in November 2018. Khan al-Ahmar was established in the wake of Israeli military’s expulsion of the Jahalin Bedouin community from the Naqab in 1950. The community moved east of Jerusalem in the central West Bank. Shortly after, Israeli authorities expelled them from there to establish the Kfar Adumim settlement, according to Israeli human rights group B’Tselem. Today, Khan al-Ahmar lies two kilometers south of Kfar Adumim in the central West Bank. The community is severed from Jerusalem by the Apartheid wall. According to Eid Khamiees, the spokesperson of the village, Khan al-Ahmar primarily relies on agriculture and animal husbandry for income. Israeli authorities classify Khan al-Ahmar as “Area C” of the West Bank, meaning it is under full Israeli military and civil control. Between 2010 and 2014, the UN Office for the Coordination of Humanitarian Affairs in the occupied Palestinian territories (OCHA) found that Israeli authorities approved just 1.5 percent of Palestinian building applications in Area C. Israeli authorities justify the demolition of Khan al-Ahmar by pointing to residents’ lack of these exceedingly difficult to obtain Israeli building permits. The destruction of the village would displace 180 people, 95 percent of whom are Palestinian refugees registered with UNRWA. Khan al-Ahmar is one of 46 residential areas in the central West Bank identified by the United Nation’s Office for the Coordination of Humanitarian Affairs (OCHA) as at risk of forcible transfer due to Israeli “relocation” plans. Map of Khan al-Ahmar and surrounding villages. Photo credit: OCHA. 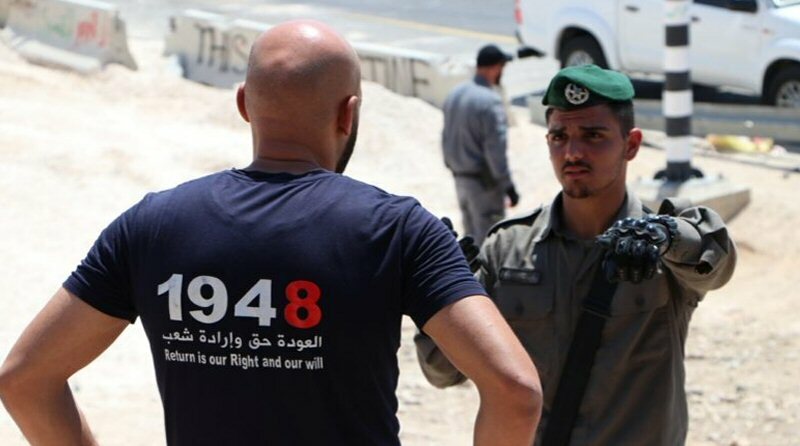 The issue of Khan al-Ahmar illustrates…Israel’s objective of widespread and systematic forcible displacement of Palestinians and replacement with Israeli settlers, as part and parcel of Israel’s broader scheme of creeping annexation. Though various in from, these policies and practices share a common underlying force: the forcible transfer of Palestinians based on their ethnicity, under the semblance of legality. Professor of international law at al-Quds University Hanna Issa emphasizes that international law prohibits an occupying power from altering occupied territory, especially for the purposes of forced displacement, which is a war crime under the Rome Statute. On September 24, 2017, the Israeli civil administration, a body under the direction of the Defense Ministry, informed Khan al-Ahmar that the village would be destroyed and the community relocated by mid 2018. On July 3, 2018, Israeli authorities delivered demolition orders to Khan al-Ahmar. The following day, the Israeli army arrived with bulldozers. Israeli forces attacked activists who protested the demolition, injuring 35. The Israeli army declared the area a closed military zone and bulldozers widened roads to make it easier to access the village. The military closed the entrances to the community with cement blocks the following week on July 11, 2018. On July 12, 2018, residents of Khan al-Ahmar secured an Israeli High Court injunction postponing the demolition of their village until August 15, 2018. Residents’ petitions to the High Court continued to be heard until September, when it issued its final approval of the demolition project. On Thursday, September 13, 2018, hundreds of Israeli soldiers invaded Khan al-Ahmar, proclaimed the village a closed military and demolished five caravans. Palestinian activists erected the caravans the week before as a protest camp following the Israeli High Court’s approval of the demolition of Khan al-Ahmar. On December 3, 2018, Israeli authorities issued a military order to extend the closure of roads to Khan al-Ahmar until January 15, 2018. Prior to these recent Israeli threats to demolish the entire village, according to Palestinian human rights group al-Haq, Israeli authorities demolished 35 structures in Khan al-Ahmar since 2015. The Tire School, September 9, 2018. Photo credit: WAFA. Included in Israeli demolition plans is The Tire School. The school was built in 2009 using ecological methods (including, rubber tires) with the assistance of an Italian NGO called Vento Di Terra. It serves approximately 70 children, who would otherwise have to travel an average of 17 kilometers on dangerous roads to attend school in Jericho. Prior to the construction of the Apartheid wall children in Khan al-Ahmar typically went to school in nearby Jerusalem. After the construction wall, school attendance rates in the community dropped, which prompted the construction of the Tire school. Activists and residents protest the demolition of Khan al-Ahmar, July 4, 2018. Photo credit: Afif Amira for WAFA. Since demolition orders were delivered to Khan al-Ahmar on July 3, 2018, residents, alongside Palestinian and international activists, have grown a strong popular resistance movement in the village. Shaikh Ahmad Abu Dahouk, a resident of the village, explains, “We are not alone. Hundreds of supporters – Palestinians and internationals – are staying with us during the day and night.” Indeed, solidarity activists support the village by maintaining a constant presence in the village, holding Friday prayers there, and peacefully resisting Israeli bulldozers and soldiers when they arrive. Israeli forces have responded to activists with violence, as on July 4, 2018, when Israeli forces injured 35 people and arrested up to 11. In September 2018, soldiers destroyed a campsite that Palestinian activists erected at Khan al-Ahmar in opposition to an Israeli High Courts’ approval of the destruction of the village. In October 2018, three activists were arrested and five injured while peacefully resisting Israeli bulldozers.